13 Mar 2012, 10:43 a.m.
A generator for pulp sci-fi settings inspired by How to Host a Dungeon and the Dwarf Fortress world generator. You can view an animated description of the setting's evolution, pause at any time, and export a detailed description of the world as a text file. To try it out, launch the program and keep hitting space to advance, or press R to enter auto-advance mode and come back later. 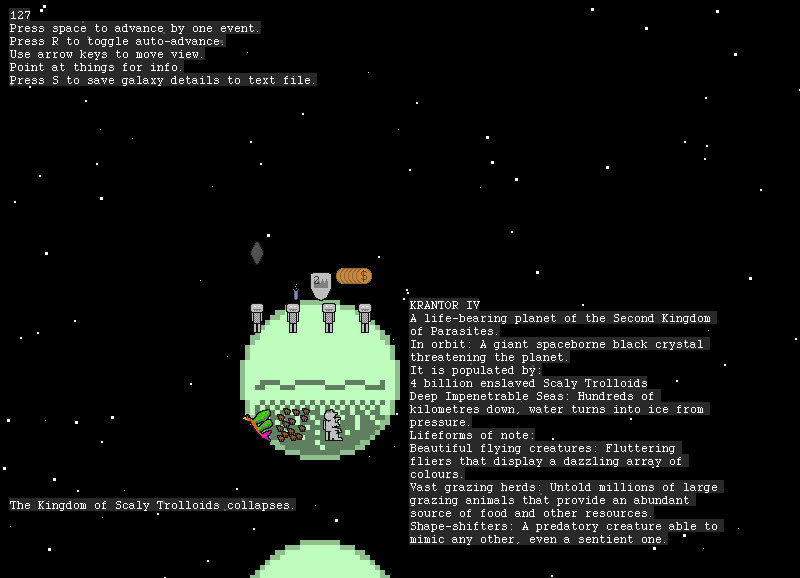 You can move around with the arrow keys and see information about planets by putting the cursor over them. tony dowler18 Feb 2014, 10:12 p.m.Wow, this looks so cool! Can't wait to try it out. Cosmobreeze7 May 2016, 3:28 a.m.Very interesting and funny. Sadly the simulation freezes at some point after giving me a by zero error. I hope that you will fix this.